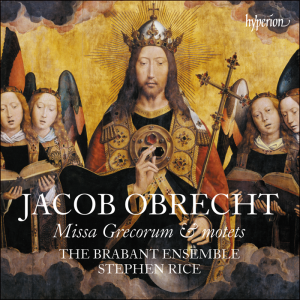 O beate Basili is, among those surviving complete, the most substantial of Obrecht’s motets not to have been recorded before now. In form it is somewhat unusual, being cast in three sections of which the third is marginally longer than the first two put together: tripartite motets more often begin with the most substantial material and conclude in a less prolix vein. The middle section reduces from four voices to three—in this regard the piece is standard for the period, as also in employing triple time for the prima pars and duple thereafter. The text is complex and difficult to construe, not least because the version transmitted in the work’s main source, Petrucci’s Motetti libro quarto of 1505, omits several phrases. The motet is also polytextual: in the first section the altus and tenor parts are in canon at the upper fifth, singing a text derived from the office of St Basil, and in the third part the bassus sings the antiphon ‘Invisit sanctus sanctum Basilium’, likewise drawn from the saint’s office. The motet begins rather peacefully, with a gradual intensification of the texture towards the end of each section, as is characteristic of the period. In the middle section the top voice intones in long notes while the altus and bassus alternate shorter phrases below; the tertia parsmoves towards homophony in uttering the name of Mary, following which the discussion of subjugating tyrants and demons brings a more energetic rhythmic texture. The extended Amen is climactic in nature.